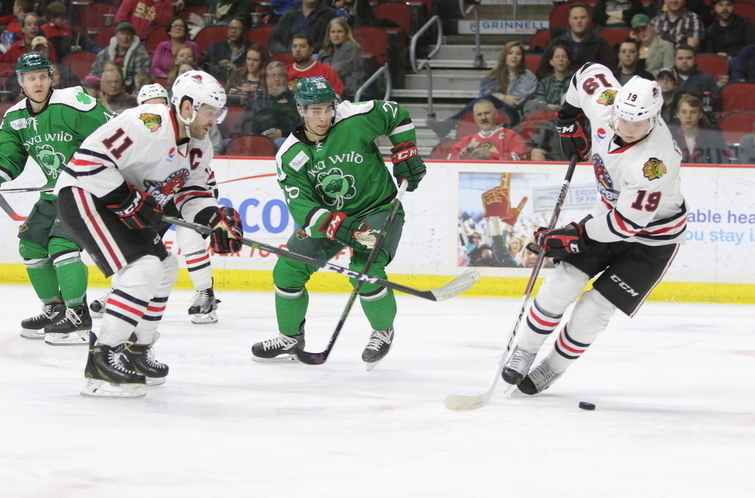 Des Moines, Iowa – Luke Kunin scored his first two professional goals in the opening frame and polished off the hat trick with an empty net tally to lead the Iowa Wild to a 4-0 win over the Rockford IceHogs on Tuesday night at Wells Fargo Arena. Luke Kunin was the story of the opening frame, as he tallied his first two professional goals just 5:42 apart. First, he polished off a two-on-one chance at 3:02 and then deflected a shot from Maxime Fortunus at 8:44 to give the Wild a 2-0 advantage. Kunin finished off the hat trick with an empty net goal with just over a minute remaining after Alex Tuch had bumped the Iowa lead to 3-0 with a backhand shot early in the final period of action. The IceHogs held their own throughout the game, but Alex Stalock once again shined for the Wild in the victory, turning aside all 32 shots he faced to earn the shutout. Mac Carruth for Rockford stood tall as well, as he stopped 22 of the 25 shots sent his direction. Next Home Game: Friday, March 31 vs. Texas Stars, 7 p.m. The IceHogs host the Texas Stars for the fourth and final meeting of the 2016-17 season. The first 1,500 fans to enter the BMO Harris Bank Center will receive an IceHogs beach towel courtesy of Peak Fitness. It's also a Blues Flame Friday pregame party presented by District Bar & Grill. Doors to the Blue Flame Lounge on the main concourse open at 5:15 p.m. for the pregame festivities. Fans 21-and-older are invited to enjoy live music from Recently Paroled, a happy hour special and free appetizers at the Blue Flame Lounge.